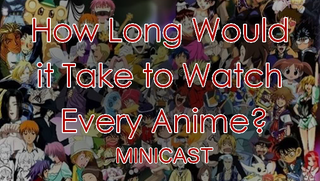 Today, a couple of us Ani-TAY authors were having a dandy Skype call and somehow the question, “How long would it take to watch every anime?” was asked. Specifically, if you started watching 10 hours of anime a day starting now (mid 2015), how long would it take to watch every anime that had already been made, including all of the new anime that would air during the time to complete this feat? The following was recorded. Keep in mind that these calculations based off values that are essentially ballpark estimates. It’s not sophisticated by any means and is only a loosely educated guess. Also, this is a snippet from the call, so there are no proper introductions.